NYC Educator: Can This Happen Here? Teachers at an elementary school in Indiana were left with bruises, welts, and in some cases bloody and broken skin during an active shooter drill in January where they were shot multiple times with plastic pellets. You don't believe this stuff until you see it, but once you do it makes sense. After all, in the United States, when there's a mass shooing in a school, you'd think we'd move to keep lethal weapons from criminals. You'd think wrong, of course. You can still get an AR-15 if you feel like shooting up a school. No, in America the conversation becomes about arming teachers. "They shot all of us across our backs," the teacher, who did not wish to be identified, told the newspaper. "It hurt so bad." 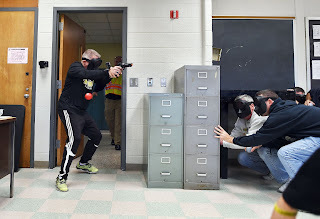 The school's Facebook page posted a photo on Jan. 4, thanking the White County Sheriff's Department for training its staff members. "Safety is priority at ML!" the post said. The teachers were instructed not to tell the others what had happened inside the room, and the sheriff's department did not warn any of the participants about what was going to happen, according to the ISTA. So you tell yourself, here in liberal New York, these things can't happen. But then you read about what's going on in Forest Hills High School. You read about what happened at CPE1. You read about what happened at Townsend Harris. You read about still-sitting principals getting away with whatever. The DOE seems to keep these people on payroll no matter what they do. In fact, you look around and we have an entire legal department, instituted by Bloomberg, that exists only to tell principals they can do whatever the hell they please whether or not they violate our Collective Bargaining Agreement. You see that supposedly progressive Mayor de Blasio has not only failed to remove them, but has also chosen to ignore the fact that they deny virtually every grievance at Step Two regardless of merit. You see the new chancellor allowing his signature to be appended to preposterous decisions. I don't know about you, but with Bloomberg's morally bankrupt leftovers still stocking Tweed, there's very little that would surprise me. Is Mayor Bill de Blasio going to let them outlast him? Will Chancellor Carranza allow them to remain as his legacy to New York City students and teachers?